I heard that song today and now it's just stuck in my head. Sorry to share my misery with you. I was a bad girl today. After I dropped the boys off at school, me and the lil' dude went shopping. Serious shopping. First stop, Barnes & Noble. Where I had a caramel frappucino and he had chocolate milk and coffee cake. And I drooled over number 19 in the new Vogue Knitting. But I didn't buy it. Then we headed off to Tuesday Morning. Which I didn't know they had around here. 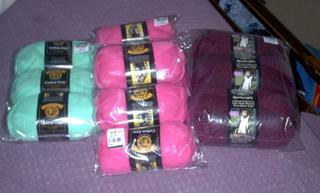 My cotton ease hoarding has become a sickness. I had 6 balls of cherry, 3 balls of cotton candy blue, 1 ball of blueberry, 1 ball of pistachio, 6 balls of vanilla, 3 balls of pineapple, and 5 balls of sugarplum. That makes 25 balls. I added nine more today. 6 bubblegum and 3 more pistachio. 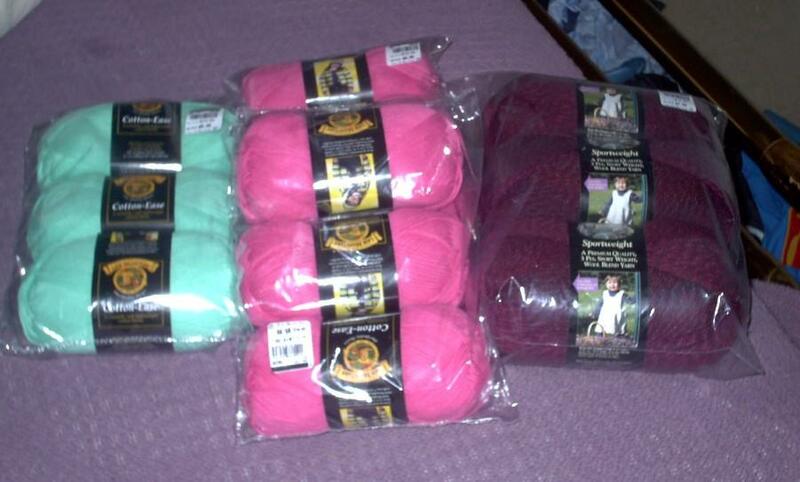 I also picked up a 3-pack of sportweight wool ease in strawberry twist. 435 yards per ball!!! I figure I can whip up a cute lightweight sweater out of that stuff. Maybe a simple top down raglan, as it is quite a pretty yarn. Then I headed back to my LYS. I felt the need to find lace. I spent a good hour in the "other LYS" looking at lace patterns. That place doesn't make me happy. Everytime I pick up a knitted sample of something to inquire about making it, they either don't have the pattern or they don't have the yarn. And they make me feel like a goober for asking. 6 balls of kid merino in a creamy white. 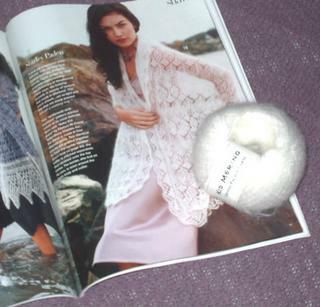 And I went to Books A Million and picked up Vogue Knitting as you can see so I have the pattern. The bad news is that the pattern is *not* charted. A thirty-six row repeat pattern and no chart? Ugh. I may have to chart it. While I was chit chatting the LYS owner asked me if I was still interested in maybe some very part-time work. So she could take a day a week off or so. Am I? Am I? Is she kidding? She's looking at it starting in October, but right now I am so excited. I guess she's pretty desperate for some time off though as she's been open all alone for nearly a year now. So woo-hoo and yay! It's pop quiz time! Can you identify this object? This is what a man does when he snags his belt loop on the arm of his work chair. Yes, your eyes do not deceive you. 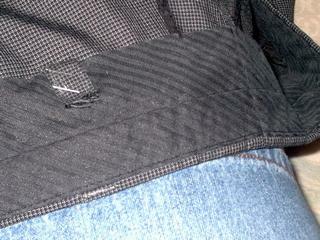 He stapled it back together. The thought of my man in the bathroom in his underwear stapling his pants back together??? That's one of those precious memories you store for a rainy day. Not funny, but kind of funny.